August 1, 1999 Avebury, Wiltshire, England - I arrived in Wiltshire on the late afternoon of Thursday, July 29th and learned that one of the more amazing formations of the past ten years had arrived that morning. The wheat field is at the ancient sacred site of Avebury and the formation is more than 300 feet in diameter, as big as a football field. I walked all though it. The wheat was laid down in extremely complicated interior lays. On the ground, it is nearly impossible to know what the whole pattern is. But from the air, it is a large triangle of thirty-three standing circles bi-sected and tri-sected by lines that many people see projecting outward into six 3-dimensional cubes. 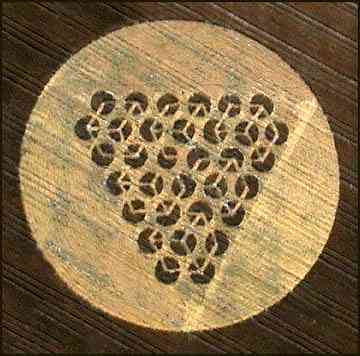 That is one of the themes this summer of 1999 patterns in crops that are forcing 3-dimensional perspectives. Aerial Photograph © 1999 by Peter Sorensen.